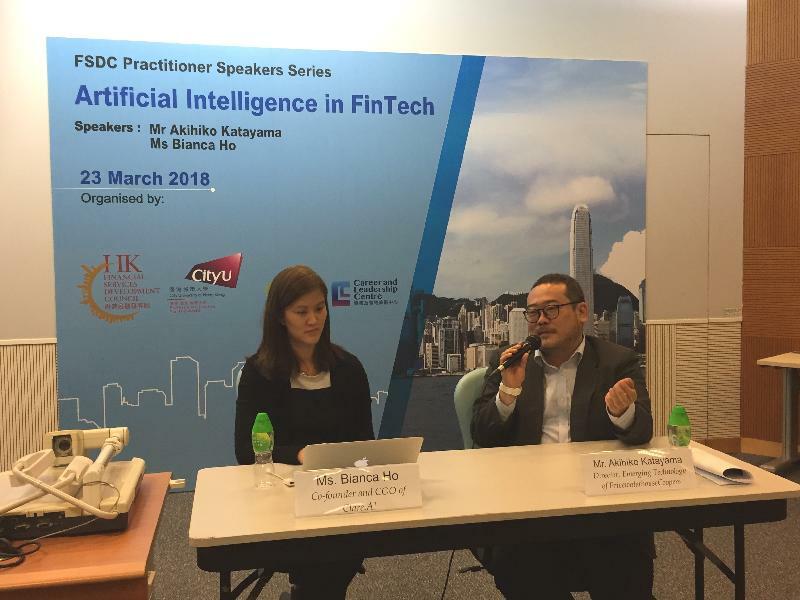 The Financial Services Development Council (FSDC) and the City University of Hong Kong today (March 23) jointly hosted a forum to explore how artificial intelligence (AI) and digital labour have shaped the financial services industry. Entitled "Artificial Intelligence in FinTech", the forum was the 27th event under the FSDC's Practitioner Speaker Series. The panel featured the China and Hong Kong Emerging Technologies Leader of PricewaterhouseCoopers Consulting Hong Kong Limited, Mr Akihiko Katayama, and Co-Founder and Chief Operating Officer of Clare.AI Ms Bianca Ho. In the increasingly digital world, new and emerging innovations are set to disrupt the ways people live, work and play. Artificial intelligence is ranked as the top technology that is expected to have the largest impact on the lives of the next generation. As AI provides incredible digital transformation opportunities to create an exciting new future for all, it is important for young talents to understand the benefits and potential that future innovations can bring. With over 20 years of experience in strategy and emerging technology, Mr Katayama believes the essential eight - augmented reality, virtual reality, 3D printing, the Internet of things, blockchain, robotics, drones and AI - are creating huge opportunities in employment and driving innovations across industries including financial technologies (FinTech). During the forum, he provided several example applications of AI technology in financial services and spoke on the challenges faced by financial service leaders to stay ahead and how FinTech start-ups are helping to face these challenges. Mr Katayama said, "AI is changing what employers need and how employees work. I am excited to be sharing with students my views on what that means for educators and students. And I hope it gives students inspiration and advice on where to focus and how they want to develop their careers." Echoing Mr Katayama's views, Ms Ho added, "While Hong Kong is not alone in having a shallow FinTech talent pool, we should explore ways to address the shortage issue, what AI means for the next generation, AI's connection to education, and how the youth can equip themselves to leverage on AI development when planning future study and career prospects." Being a co-founder of a successful start-up, Ms Ho covered how students should equip themselves for AI. Her opinion is that observation on popular trends and hands-on experience are of crucial importance. Ms Ho added that AI is more like a complement than a substitute for humans. The key is the co-operation between humans with machines, so knowledge on data science and computers, be it basic or in-depth, would be advantageous, she said. The FSDC's Practitioner Speaker Series is a project developed between the FSDC and local universities, with speakers from the financial services industry giving talks to university students about important industry facts and the skill sets required in developing a career in financial services. The Hong Kong Special Administrative Region Government established the FSDC in 2013 as a high-level, cross-sectoral advisory body to engage the industry in formulating proposals to promote the further development of Hong Kong's financial services industry and to map out the strategic direction for development. The FSDC set up five committees, namely the Policy Research Committee, the Mainland Opportunities Committee, the New Business Committee, the Market Development Committee and the Human Capital Committee, as the five streams of its work.